and don’t have the time for a slow, gradual evolution. One of my colleagues says her most important take-away from the recent United Astrology Conference (UAC) was from a talk by Serbian astrologer Aleksandar Imsiragic. Aleksandar said that the seven exact hits of Uranus square Pluto, the first on June 24, correspond to realignment of our seven chakras. I deeply resonate to this idea, and it seems too important a concept not to share. From what I hear, since I did not attend this particular presentation, Aleksandar’s remarks on this topic in his lecture on the Political and Mundane Track on Crucial Fixed Stars Influence, 2012 to 2015. (Reminder that CDs from the conference are available: http://www.uacastrology.com/). I am in the universe. The universe is in my body. The universe and I are combined together. Many astrologers are metaphysically inclined, and we’ve heard about energy frequency shifts since the Harmonic Convergence in 1987. We are being rewired to handle a bigger energy load. This will give us the juice to become quick-change artists—to evolve not at a snail’s pace but rapidly to meet the growth spurt whose brink we’re sitting on. Most of us sit there in some degree of discomfort. That’s only because our circuitry awaits this Uranus square Pluto awakening and rebirth. Since we sit on our first chakra, my choice of words (unconscious until I reread them) makes sense. The cosmos also has a great sense of humor. To fly by the seat of our pants—to respond and react from instinct in the highest way that these new energetics will allow us—we need to start our realignment in the chakras from the bottom up, starting with first two where we sit. And, indeed, sitting in meditation is how we make it happen. Let’s look at each exact alignment of Uranus square Pluto  and its associated chakra. 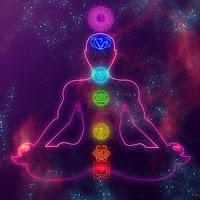 Below is a review of the features of each one and a suggested short meditation or affirmations for focus during the months that specific chakra realignment is being activated. Color – Red, Element - Earth. The first chakra is our grounding cord, our interface with the Earth on which we walk. To run high frequency energy, grounding is essential or we’ll blow our circuits. This energy center is related to issues of security and safety. A stable first chakra, indeed, is the “root” that allows other changes to grow from it. First/Root Chakra Meditation: I am safe, secure and grounded. I expand my ability to manifest and bring into practical application my spiritual ideals—my beliefs, goals and desires—and to meet my material needs. I embrace the element Earth, where I walk on sacred ground. Color – Orange. Element – Water. Associated with creativity and sexuality. Second Chakra Meditation: I create from the river of life and send my creations back to the Ocean of All. I express myself with passion, gratitude, joy and generosity. I open to limitless creativity and passion and the happiness that comes with them. Third Chakra Meditation: I trust my feelings. They are my power. My body responds to all questions and provides answers. The universe is in my body. I open to interpreting and following my instincts. Fourth Chakra Meditation: I send tender thanks to my heart for pumping life through my body and being. I protect my heart in the glow of universal love, as I gently open it wide to forgive, forget and expand my ability to love and be loved. I open to becoming more human. Color – Blue. Element – Air. Associated with communication. Fifth (Throat) Chakra Meditation: I communicate with crystal clarity the truth and power of All I Am. My words heal, join, and send love into the world. I open to quickened, clear communication. Color – Indigo. Elements – Air and Water. Associated with intuition, clear-seeing or clairvoyance. Sixth (Third Eye) Chakra Meditation: I see life with the inner eye of universal love and knowing. I open to visions, cosmic wisdom and seeing the vast possibilities of my own potential and the evolution of all humanity. Color – Violet or Brilliant Light. Element – Ethers. Associated with God realization or cosmic consciousness, self-knowledge and self-awareness. Seventh (Crown) Chakra Meditation: I am that I Am. I let cosmic information and inspiration flow into my crown. The universe and I are combined together. I expand this energy funnel to know without limits. Some of these associations are no-brainers—Venus with the heart chakra and Mercury with the 5th/throat chakra, for instance. Mars fits the 3rd/solar plexus because this is where people can “cord” and manipulate us, seizing control of our personal power. It’s also where we feel negativity or psychic attack when it’s thrown at us, as well as where we receive friendly lobs of good vibes that enable us to trust someone immediately. I do think that the outer planets have a place just outside, if not within the chakra scheme. Ray Grasse doesn’t state a planetary association with an additional 8th chakra that rules transcendence and inspiration. Letting the outer planets into the act, I’d assign that to Neptune. All great ideas are in the cosmic soup. We transcend and are inspired—we access these ideas—by tapping into the One Mind. Uranus awakens power in the chakra system. Chiron acts as a transformer. It amps energy down, as needed, to help bring highly resonating Uranian information to the chakras at a speed they can absorb as they adapt to the new message on the cusp of amplification. I believe this because Saturn rules form, Uranus rules electricity and electro-magnetic fields. Chiron orbits between these two planets and acts as their intermediary. I believe Chiron acts as a bridge between Saturn and Uranus in the chakra scheme, too. In Chiron’s famed role as a healer, wellness often comes from shifting energy flow (chi or qi), stimulated by tools such as acupuncture needles or qigong exercises. Healing is closely connected to energy shifts. Pluto, the bringer of birth-death-rebirth and end/beginnings handles the cord of this energy system. Pluto either yanks the cord out or plugs it in and is quite adept at both. We are born. We live and die a million small deaths during one lifetime on Earth, and after each demi-death, we are we are reborn again. (Plug in, plug out.) For those who join me in believing in reincarnation, this is also true in the larger sense after our one actual death in this lifetime. Unplug and replug into a new birth and incarnation. This reality still rocks my world and is my personal reason for wanting to be in conscious coordination and harmony with the current and upcoming opportunities to rewire each of my chakras. I suspect that people who do so will have a much easier Uranus square Pluto than those who don’t—and I hope to hear back from readers on your experiences. There is plenty of time over the next three years to focus on each chakra whose “expansion” is on tap. Here’s something to try during your regular meditations. Focus feeling the energy of the particular chakra that’s being touched by Uranus and Pluto. 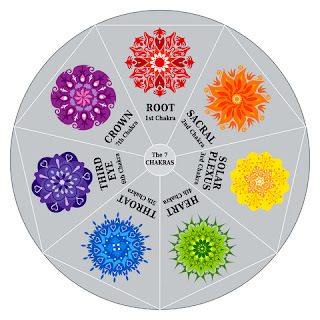 Envision the chakra wheel enlarging or spinning faster. Tune into the changes and how you’re doing with the issues represented by each chakra. You might consider opening your meditation with the affirmations for each chakra, envisioning the colors and element of each one, enhancing your overall energy flow by this acknowledgment. Spend more time on the Now Chakra, the one being aligned by the current close Uranus-Pluto square. If you have Cardinal planets being activated by the Uranus-Pluto Square, meditate on the issues they represent, too. When focusing on the chakra that’s up for realignment now, be sure to clear your mind and just “run energy” so that this chakra can talk back to you. My first spiritual teacher used to say praying is talking to God; meditation is listening to him. During meditation, it’s important to quit talking—even our affirmations or mantras—long enough to let All That Is get a word in edgewise. If you explore the sites on chakras in the Notes, you’ll find many other tools for working with chakra alignments. Some include resonant gems, homeopathic remedies or flower essences. Be sure to work with the physical at some level, especially during this First Root Chakra Alignment. Garden, dig in dirt, have bodywork. (You’ll need it after the gardening.) Count your money. Count your blessings for every material gift—aloud, even if only to yourself. Involving the physical continues to anchor every change. These years of major transformation are a great time to keep a journal, written or audio, on how your body-mind-spirit is absorbing this Cardinal realignment. You’ll be growing so fast, you might want to go back and look how you got there—and be able to share tips for accelerated evolution with your friends, loved ones—maybe even the world. You Expanded to meet rapid evolution. As the Hopi and many others have foretold, we are the Ones that we have been waiting for. If a simple but profound chakra tune-up helps us rise to that occasion, let’s sit in stillness as often as possible during this critical rite of passage and let the brighter, new cosmic light flood through our bodes, minds and spirits. I was thrilled, after writing this article, to discover The Grounding Touch. This site has everything you need to focus on retuning each of your chakras, including concise info about each one, yoga poses, mantras and aromatherapy. Enjoy! 4. King James Bible, Matthew 5:14. Great Post, Joyce. Thank you for sharing this timely info. Sandra and Kat, thanks for letting me know you appreciated this post. Be sure to go back and look at the New Resource I just added at the bottom. I just discovered it, a site called The Grounding Touch. It's a very amazing Chakras 'R' Us! what a beautiful article, Joyce. So clear and encouraging, and a wonderful Chironic merging of the chakras and the planets. Seems like the big square gets the best out out you! I'm definitely in the rebirth canal, and while it's a little dark and scary at times, it feels great when I can shine a light for others and myself. I sense my realignment with the cosmos on all levels--that part's a very good feeling! Great to connect, Ken. Glad you like the article, and thanks for noticing the typo on the HC date--or maybe it was slip because summer of '88 was a very personally significant time. I'm much looking forward to reading your article. Thanks for sharing.